Pupils from Glaitness Primary School in Orkney stepped back in time this week to become junior guides at Bishop’s and Earl’s Palaces. EDINBURGH, 2015-4-20 — /Travel PR News/ — The Primary Six class have been training for the past few months to provide guided tours for visiting pupils from all over Scotland as part of Historic Scotland’s Junior Tour Guide scheme. Dressed in historical costume as characters from the building’s past, they will now bring the history of the building to life for their peers. The Junior Tour Guide scheme has been running at the Bishop’s and Earl’s Palaces since 2010, but this year for the first time some Orcadian Scots phrases have been included in the script. Pupils spent their spring term learning all about Kirkwall’s history, as well as learning over 50 words of Orcadian Scots with support from the school and Education Scotland. They were also trained in tour guiding and drama by Illuminate UK in readiness for their first tour on Friday 17th April. A joint project between Historic Scotland, Illuminate UK, Education Scotland and staff from Glaitness Primary School, the junior guides scheme aims to support teachers in implementing Curriculum for Excellence, and to increase community involvement and ownership. “The children from Glaitness Primary School approach the project each year with such verve, energy and enthusiasm – they make some of the best Junior Tour Guides in Scotland. In costume and character as the people who would have lived and worked in these wonderful buildings, their tours are informative, fun and entertaining. “Education Scotland have been working to promote the Scots language in schools and when we heard about the Junior Tour Guide scheme we knew it was the ideal project to do this. Scots would have been spoken in Renaissance Orkney by the earls and staff who the pupils play in their tour. The Junior Tour Guides gave their first tour of the Bishop’s and Earl’s Palace on Friday the 17th April. 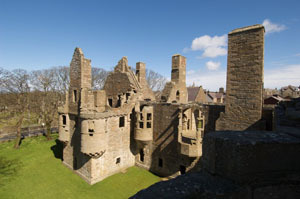 Historic Scotland is an executive agency of the Scottish Government charged with safeguarding the nation’s historic environment. The agency is fully accountable to Scottish Ministers and through them to the Scottish Parliament. 2015 is the Year of Food and Drink, a celebration of Scotland’s natural larder and the role that food and drink plays in shaping our economic success. Scotland generates over £2.5m per day through food and drink tourism. A series of themed months will create an appetite for key areas of Scotland’s food and drink industries – from seafood and whisky to berries and high-quality meat. To find out more visit www.visitscotland.com/tastescotland. This entry was posted in Society, Tourism, Travel & Kids, Travel Management, Travel Marketing, Travel Services, Travelers and tagged Anne McRae, Historic Scotland’s Junior Tour Guide scheme, junior guides at Bishop’s and Earl’s Palaces, Karen McKenzie, Pupils from Glaitness Primary School in Orkney, Simon Hall, Sylvie Clarke. Bookmark the permalink.